NEIU-Ground is a community garden partnered with the Peterson Garden Project. Just like the campus, NEIU-Ground is a diverse community of all ages and ethnicities. The hands-on connection one has with earth is an unexplainable feeling that creates a contagious positive energy. The Peterson Garden Project is a non-profit urban gardening organization that has raised garden beds in plots all over Chicago. 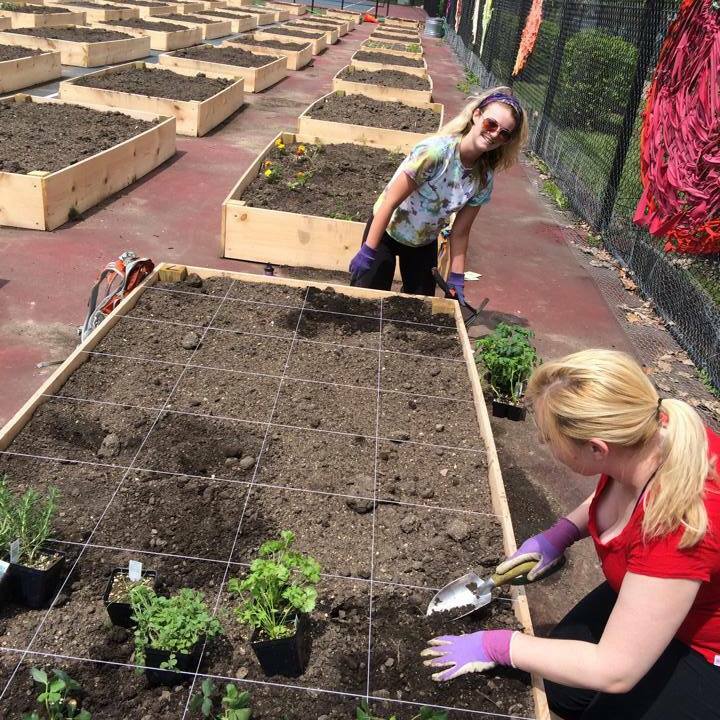 NEIU is fortunate enough to be part of the urban gardening movement, using the tennis courts as a fenced plot for almost 100 raised garden beds. Through the Peterson Garden Project website, students, staff, and the community can register for their own “raised bed” and join the experience. The feeling of community is strongly present as people bond over the diversity of each garden bed. Everyone is friendly and interested in what you are growing in your garden. The organization was created to teach you how to grow your own food. It also promotes the importance of economical, organic, pesticide-free food that you personally grow, thus knowing exactly where your food comes from. Throughout the season, there are several events and classes you can partake in at the garden. Music in the Garden or Grewbie classes are scheduled, thus strengthening the community vibe and teaching new gardeners tips along the way. Being a part of this organization inspired me to take the hobby further. My mission is to take what I have experienced and spread the energy through low-income neighborhoods on the south side of Chicago. Seeing first hand the sense of community and connection created through the gardens energy at NEIU, I feel this movement is essential for low-income communities. The economical aspect of affordable, accessible food is what could truly benefit these neighborhood communities. I want to focus on the communities who face hunger and poverty. Urban gardening can be a beneficial hobby for kids and provide a safe space in the neighborhood where they can learn where their food comes from. Being a social work major, I’m making it my mission to inform low-income neighborhoods about urban gardening and its benefits towards rebuilding community value. The NEIU-Ground community has inspired me to spread this infectious movement in hopes of a healthier future, both mentally and physically for youth. This movement can change the way we eat and purchase our food, while restoring our connection with earth and humanity. Anyone can take part in the movement by joining the NEIU-Ground location or other location through the Peterson Garden Project.